It is valentine's day, so some love poems from Rumi would be in good order. Suddenly the drunken sweetheart appeared out of my door. She drank a cup of ruby wine and sat by my side. My face became all eyes, and my eyes all hands. A couple of cool astronomical finds in the last couple of days. First one you can see on the left in a picture from the Spitzer Space Telescope. It is a cluster of newborn stars called NGC 7129, 3300 lightyears away in the constellation Cepheus. 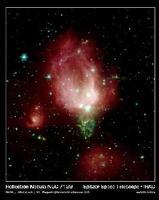 The nebulosity is rose-colored and rosebud-shaped. And all these stars are found in a piece of space about the same size as the distance between the Sun and the nearest star to here, Proxima Centauri. What you see on the right is not a photo. But what it depicts is rather amazing. It is a crystallized white dwarf named BPM 37093. A white dwarf is the hot core of a star, left over after the star uses up its nuclear fuel and dies. It is made mostly of carbon and is coated by a thin layer of hydrogen and helium gases. 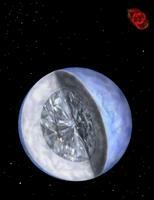 And in this case it has now been found that the core of this star is solid diamond. It is 2,500 miles across and weighs 5 million trillion trillion pounds, which translates to approximately 10 billion trillion trillion carats, if you want to measure it as an earth diamond. Supposedly our sun will end its days as a diamond as well.